The name of Ray Harrison is probably not one that comes quickly to the minds of Burnley supporters and yet he has a place in our history through scoring the goal that took us to our first ever appearance at Wembley. 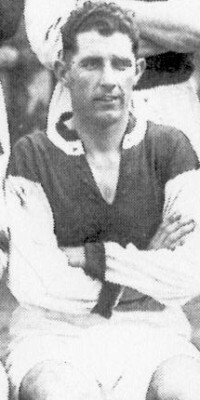 Ray was one of a host of players who lost a lot of his career due to the second world war. He had just past his 18th birthday when war broke out and was playing football for his home town club Boston United in the Midland League. For the next seven years, with league football in England suspended, he played in war time games and also played in a British Army of the Rhine representative team. By the time football resumed he was aged 25 and Burnley manager Cliff Britton snapped him up just after the start of the 1946/47 season and he made his debut in a 3-2 defeat at Newcastle in the following month. A week later he scored the only goal of the game in a home win against Swansea Town. A centre forward, but he wasn't a prolific scorer, and in that promotion season of 46/47 he netted just five goals whilst playing in just over half of the games. However, the FA Cup proved different and as Britton's team marched on to Wembley and a date with Charlton Athletic he scored no fewer than six of our goals. There were two in a 5-1 home win against Aston Villa in the third round and he followed that up by scoring all three in a 3-0 replay win against Luton in the fifth round, again at home. Then came the most important goal he ever scored for Burnley. We'd drawn 0-0 with Liverpool in the semi-final at Ewood Park and two weeks later played the replay at Maine Road. It was again goalless until eleven minutes from time when Harrison grabbed the winner to take us to Wembley. He'd had spells in and out of the side, vying for that centre forward place with Jack Billingham, and things didn't change in the first two seasons following promotion. When the competition got greater with both Jack Spencer and Alf Clarke challenging for a place he decided it was time to move on. That move took him to Doncaster Rovers in December 1949 in a £10,000 transfer, where he played alongside Peter Doherty in the side that won the Third Division North title. He remained with Doncaster until the summer of 1954, playing over 120 games for them and scoring 47 goals. His last league club were Grimsby for whom he signed in the summer of 1954 and he had just the one year with them but it wasn't a great season for them as they had to apply for re-election. With his 34th birthday on the horizon he decided to retire from league football at the end of the 1954/55 season. But he continued playing non-league football until he was past 40, firstly with King's Lynn and then as player/manager of Frickley Athletic. When he did finally call it a day he settled in Doncaster and run a sports shop for a number of years before his retirement, and he remained in Doncaster until his death. He might not have been a big name in the club's history, and he might not have played for us for too long, but he's one of only three Burnley players to have ever scored a winning goal for us in an FA Cup Semi-Final.